Reclaim your street for a day! Create a more resident friendly road, an “open street” – to enjoy the space to celebrate, party, chat, walk, bike, dance or play. There are many ways to make this happen, whether you wish to only claim a few roadside parking places by laying out artificial grass to drink tea and cake, swap plants or ideas or temporarily open the entire street for the residents to celebrate together, start a “playing out” scheme or just enjoy a vehicle free day. If you are planning a Street Party, Street Social, Playing Out or a Swap Shop, the Bristol /BS6 Open Streets project is here to support and encourage you, with practical advice and the offer to lend essential equipment such as “Road Closed” signs, bunting and more! The purpose of Sustainable Redland’s BS6 Open Streets Project has been to encourage and support small residential community street based events, achieved by loaning essential equipment (signage / bunting etc) and presenting helpful advice online. 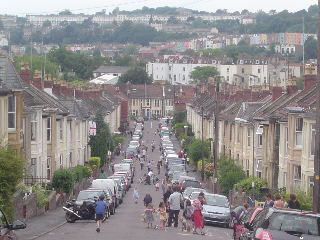 Back in 2011, after some Sustainable Redland members helped host their own street parties, the positive benefits of micro local events were considered as worth promoting. After securing a grant from the Neighbourhood Partnership Community Fund, the next task was to decide how the project would work. Gay Johns joined Hamish Wills to work out the WHO, WHAT, WHY, WHEN, WHERE and HOW structure. The decision was made to purchase traditionally ‘expected’ street party items, which could be shared and reused (loaned with fully refundable deposit requirement) within the BCR area and booked online. With a plan established and advice sought from Chris Gittins (Streets Alive), BS6 Open Streets was launched in early 2012, with a logo, flyers, press releases, informational documentation, a shared admin database and own website. So far, this project has provided more than 55 street events with festive bunting / road closed signs / traffic bollards and a host of other helpful items.